Fulfill your pet's identification needs with one easy solution! Our ID collars are silent, chew proof and easy to manage. 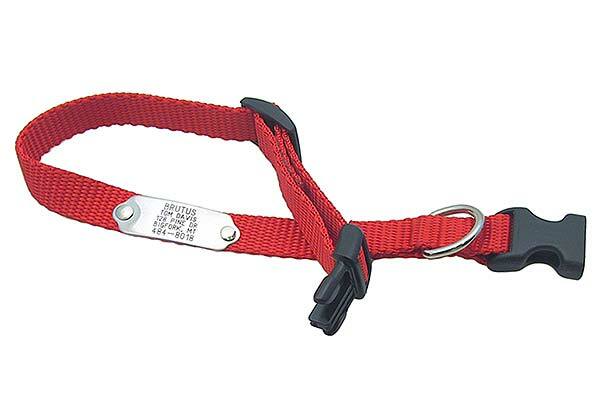 Featuring an adjustable nylon collar with a quick release (not breakaway) buckle and a metal tag that is attached permanently with matching rivets to lay flat against the collar. Choose from a stainless steel or polished brass tag, and a collar color of Red, Blue, Green, Black, Pink, Purple, Neon Orange, Neon Pink, or Burgundy. Available in adjustable sizes ranging from 5/8"x8-12", 5/8"x10-16", 1"x12-18", and 1"x18-26". Please note - we found that the Neon Pink and the Red can bleed color if they get wet, so we do not recommend Neon Pink or Red on white fur. We also offer these tags and collars separately. To see the tags, click here, and to see the adjustable collars, click here. See the pull down menus for our full selection. For the ultimate in protection, add our popular OWNER ALERT! pet recovery service to this tag. Have a paper form with a different price? Click here.